Log Cabin, 2 Bedrooms, 2 Baths, @ Screened Porch, Covered Porch..
We purchased Log Heaven brand new in 2001 and it was love at first sight! Ty and I are originally from Chicago and the thought of owning a log cabin in the Smoky Mountains excited us beyond belief. The beautiful country heart pine wood floors, tongue and groove log interior, green metal roof and the enormous 25' vaulted ceiling with huge exposed beams took our breathe away. Just recently we purchased new top quality pillow-top mattresses (except for the single bunk beds) for your sleeping pleasure. Adventuresome adults, honeymooners, those celebrating second honeymoons, anniversaries, birthdays and all the other special occasions...especially love our privacy and beautifully landscaped setting. A Log Heaven is perfect for a couples getaway...romantic and secluded! It's also perfect for a girlfriends getaway...so many things to do...and that's without leaving the cabin! And....it's perfect for families...everyone has their own space. Located only a few minutes from Bryson City, we offer a great location...(we think the best location of all)... right in the midst of everything ... an easily accessible road (that means you don't have to drive a 4-wheel drive vehicle), a paved driveway, wonderful views that you will fall in love with, and nature and seclusion at its best... Recent guests were thrilled to discover deer in our back yard!! With a large great room that has a 25' vaulted ceiling and exposed beams, an open floor plan, two bedrooms plus a large sleeping loft , two bathrooms, a large screened porch and a front covered porch with rockers and swing... (both porches are on the second floor where you will enjoy the wonderful mountain breezes) and because we love games, we have a mini-game room with foos ball and a dart board ...we also have a large hot tub for adults use on our landscaped patio and a wood burning portable fire pit in the back yard. We are just a few minutes away from Bryson City... known as the 'Outdoor Adventure' capital of the Great Smoky Mountains. Bryson City is a 'real' town...it isn't overrun with tourists, and it has it's own special quaintness and charm. Bryson City qualifies as the center of outdoor adventure in the Southeast. For four decades, the Nantahala Outdoor Center in Bryson City has provided rafting, paddling instruction, and supplies to adventurers of all ages. We are centrally located for all of the Smoky Mountain activities! Bryson City offers unparalleled views, along with miles of hiking and biking trails (hike the Appalachian Trail...it is only 10 minutes from Log Heaven), mountain golf at the Smoky Mountain Country Club and the scenic Great Smoky Mountain Railroad. Nearby Fontana Lake is a beautiful mountain lake where you can swim, fish, and rent a pontoon boat for either half or the entire day. Also nearby is the Nantahala Outdoor Center for white-water rafting and kayaking, horseback riding, and the scenic Blue Ridge Parkway. Some of the most strenuous and scenic mountain biking trails in the east are found in the Tsali Recreation Area near Bryson City, Cherokee (where you can try your luck at Harrah's Casino or go to the wonderful new movie theatre), Gem Mining, and Deep Creek for tubing, hiking, horseback riding and picnics. Western North Carolina is absolutely great for flea-markets and antiquing ...and... maybe best of all, Ingles Supermarket is only minutes away. * COME TO LOG HEAVEN FOR AN AFFORDABLE, FUN AND RELAXING VACATION! * NO SMOKING EXCEPT ON PORCHES.. . .
. 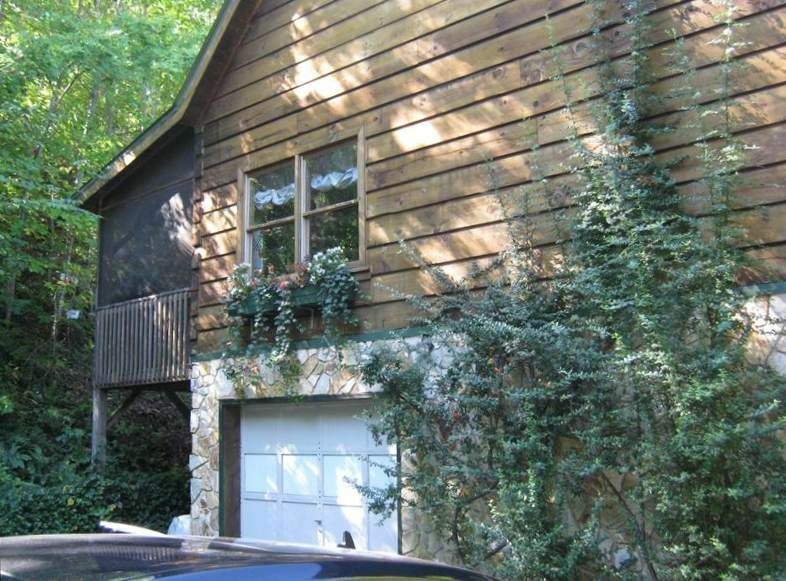 If Log Heaven is booked for your desired dates, be sure to check Retreat in the Sky on vrbo #3362 in Bryson City (our other vacation home). Maybe it's available! We welcome you to our website, Log Heaven in Bryson City, North Carolina. I'm Sandy and my husband is Ty. We would love to have you as guests at our vacation home! Even though we are originally from Chicago, we now live in Columbia, SC. I guess you could say we also live in Bryson City, NC because we spend so much of our time there. We love to hike and the Appalachian Trail and Deep Creek are some of our favorite places. We also love nature and enjoy all the deer, owl, turkey and rabbit sightings on our property...and even a bear. Mostly, we just like to hang out...do some gardening, reading, enjoy our family, play games, and relax in the hot tub. In 2001, it seemed like a great idea to invest in vacation real estate. We had built Retreat in the Sky, our vacation home, three years previously and we had begun renting it to vacation guests with much success. We searched and searched to find another vacation home that guests would love and take good care of like it was their own... and that would be a good investment for us. When we found Log Heaven, we knew it was exactly what we were looking for. Log Heaven has so many outdoor spaces sometimes we just don't know where we want to 'be'. Our choices include; a covered front porch, a large screened porch, or...our patio with hot tub. Our location is close to Ingles and the town of Bryson City. We still pinch ourselves that we found the perfect vacation home for us and for our guests! Bryson City is a very charming town surrounded by mountains. Great restaurants and darling shops. It even has its own brewery. Let's just say it has something for everyone. There is no longer telephone service at Log Heaven. However, cell phone service (except for Nextel/Sprint) is excellent! Parking area with space for two vehicles. Please be very careful of our well cover when parking. Also when backing up. Please do not change the settings on the refrigerator to make it colder. You can keep beer very cold in your coolers. Help yourself to any food items on the refrigerator door including condiments. Includes stove/oven, dishwasher, refrigerator, garbage disposal, microwave, small appliances and enough kitchen stuff to pretty much fix whatever you like to eat!! Bookcases filled with books and current magazines for that quiet time. Small yard with firepit and chairs. Two Porches. One is a covered porch with rockers and swing, the second porch is screened in with table and chairs for dining and lots of places for reading, bird watching or just relaxing! Our patio has a large hot tub, umbrella table and chairs. We have just added a wood-burning portable fire pit beyond the patio where you can spend your evenings roasting marshmallows and telling ghost stories. We offer two porches...one is screened and the other is covered. With comfortable furniture, they are a great place to hang out. All in all, we offer over 1,000 sq. feet of outdoor living space! Large hot tub on landscaped patio. Available March 15 through January 1. What makes Log Heaven such a special vacation home? Well, it is very, very private. You will drive through a beautiful woods (where you will not see another home) to reach it. Yet, it is very easy to find, you don't need a 4-wheel drive vehicle and it is only a few minutes to Ingles (Supermarket) and Bryson City. You will love the porches, one is covered and the other is screened-in or maybe you want to 'hang out' on the patio... the kids (or the young at heart kids) love playing foosball and darts in the mini-game room. Roast marshmallows and tell ghost stores at the portable fire pit in the backyard. You can even sing 'camp' songs because there is so much privacy. Log Heaven is truly a wonderful escape from the everyday hassles...you can relax, relax, relax! And love it....like we do! Loved it. Will book again in future. Home was beautiful and everything was provided. Felt very much at home, but without the stress. Sorry that the hot tub wasn't available for use. Maybe next time. We visited Log Heaven during Christmas and had a wonderful visit to western NC. We visited Fontana Dam, Gatlinburg and even took a train ride from Bryson City to Dillsboro! Sandy had the cabin decorated for Christmas for us and it was lovely. Being from Florida I wondered about the gas fireplace putting out enough heat ~ but, boy did it! Even though we would turn it off before bed - it was always still comfy in the morning:) We hope to visit again. Maybe next time in the summer! Thank you so much for being the wonderful guests that you were! We hope you will return to Log Heaven or visit our other vacation home at VRBO 3362. Beautiful cozy cabin in a wonderful location. We enjoyed hiking, visiting the small shops and eating at the winery. The cabin is beautiful and has everything you need! Amazing! Log Heaven is a beautiful, comfortable cabin nestled in the woods. It was conveniently located close to family and activities we had planned. The Nelsons were eager to make our stay comfortable and pleasant. The property and the cabin were beautiful!! The surroundings are very private and peaceful! The property owners have thought of everything to make your stay so enjoyable and relaxing! The decor is welcoming and the house has all the amenities you need to have a stay with not a care in the world!! There are so many things to do in the surrounding areas and the cabin owners have put together a notebook that explains all the details, maps, etc! We had such an enjoyable time. It was the perfect place to get away from the big city!! This is the second time we have stayed in this cabin! We love it! The property is secluded, yet very close to all of the thing's we like to do and see while we are in the area! The owner's are great! Relaxing with massages, facials, pedicures, etc. at the wonderful, full-service Spa at Lake View at Fontana. Or, renting a pontoon boat for 1/2 or all day at Fontana Lake. Tubing at Deep Creek, Whitewater rafting and kayaking on the Nantahala, Gem Mining, Mountain Biking and Horseback riding at Tsali. And what everyone loves and is talking about....Ziplining! All within a short 5-10 minute drive. A little longer drive will take you to the Biltmore Estate in Asheville, riding the Blue Ridge Parkway, snow skiing and snow tubing in Maggie Valley, hiking at the Joyce Kilmer Forest and shopping till you drop in Highlands and Cashiers...and don't forget the magnificent waterfalls on the way. You will never run out of things to do!